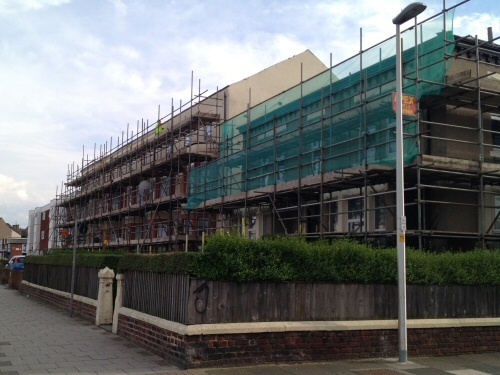 At Apex Scaffolding, we have over 25 years experience of erecting scaffolding throughout Blackpool and the Fylde Coast. Blackpool Council - Numerous civic projects, including scaffolding contract for new build of Palatine Library and Swimming Baths, plus emergency scaffolding services. Blackpool & Fylde College - Remedial works to Palatine Road campus and refurbishment of Ashfield Road campus. Blackpool Sports Centre - Scaffolding for new boxing gym. Emergency call-outs. Blackpool Victoria Hospital - Access over pipework to machinery in the Boiler Room. Scaffolding for new A&E, Children's Ward, plus external remedial works. Hounds Hill Shopping Centre - Remedial works to the interior and exterior. Imperial Hotel - Scaffolding to allow for significant external remedial works including roofing, windows and pointing. Blackpool Pleasure Beach - Refurbishment of the Carousel (a listed building requiring a replacement roof). Replacement of concrete supports to Watson Road tunnel facilitated using laced "Strong Boys" to support the weight of the bridge during repairs. Blackpool Airport - Edge protection and netting during new build of a hangar. Regents Court (opposite Metropole Hotel) - Refurbishment of large block of flats (10 storeys) on Blackpool promenade. North Pier - Scaffolding for works in Theatre and on the Frontage, plus remedial works to the pier structure. Blackpool Tower - Internal remedial works. Winter Gardens, Blackpool - Stage works. Lighting gantry.